I think that one of the earliest public privies (pardon the oxymoron) in London was the Lincoln's Inn bog house built in the late 17th century. Planning for this "house of office" in Base Court began in 1689, when a passage to the bog house was to be built in Fickettfields according to the Articles with Mr Searle dated 12 and 17 February 1691. The Terrace walk in the Lower Ground was raised from the earth dug out for the bog house. The siting of the bog-house was a problem, because of the unavoidable smell. The Council met on 1 July 1691 and "Ordered that the intended new bogghouse be not placed nearer to the kitchen garden wall than the outside of the seaventh window of the new building, and so to be carryed on southward; and that Dr Barbon be desired to beginn and finish the said new bogghouse forthwith." Complaints were made to the Council that the builders "doe intend to place the new Bog-house, to be built for this Society, nearer or adjoyning to the Kitchen Garden wall then he or they ought to doe, and which, if done, will be to the great annoyance of the inhabitants of those chambers adjoyning to the said Kitchen Garden". A Committee duly met on 6 November 1691 "to inspect and consider of the ground, wayes, and passages belonging to this Society without the Back Gate, in or near Ficketts Field; and that the said ground, wayes and passages be measured, in order to discourse with Dr Barbon concerning the same." As part of this long-running dispute over the siting of the bog-house, a boundary stone was to be set up, at the east wall of No 11, New Square, on 17 February 1692, and a contract stating the exact position of the bog-house was written in Latin, appropriate to a society of lawyers. 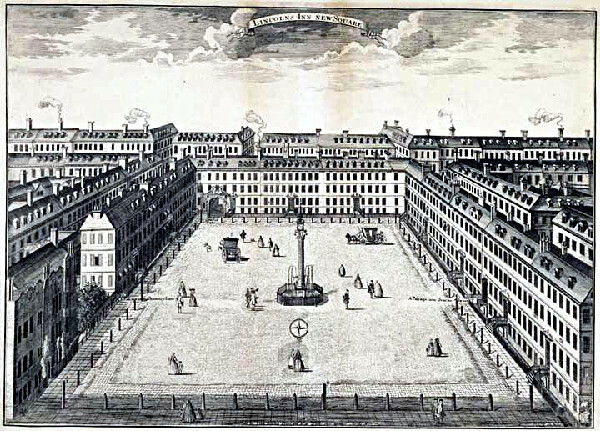 Though the cistern for it was dug in 1691, it was decided on 27 October 1692 to build the above-ground structure from the southeast corner of the kitchen garden down toward Bell Yard on the east side of New Square, Lincoln's Inn, and it was completed by the end of the year. It consisted of a long narrow building containing six privies. By 1693 the open kitchen garden behind it (i.e. between Serle Court and Base Court) was known as Bog House Court, and a wall was built for enclosing the back yard behind it. A plaque (still there) was put up on the end-of-terrace wall of the adjoining chambers forbidding the construction of any windows looking onto this area. The Lincoln's Inn bog house acquired fame rather quickly, and we can deduce from a reference in Ned Ward's London Spy (169899) that its users cleaned themselves with their fingers rather than any bog-house paper. Ward talks about sleeping in a night cellar whose "walls were adorned with as many unsavoury finger-dabs as an Inns of Court bog-house" (issue no. 3). In 1725 the occupants of the chambers around the square had to pay a yearly sum of �for cleaning out the privies regularly, and � for a porter and a watchman for the Square. These charges were now to be paid by the proprietors of the chambers rather than by the Society as a whole. Coaches and horses were no longer allowed, and lighting was improved. The fountain in the center of New Square was repaired in the spring of 1730. (The same system of water conduits connected the bog-house and the fountain.) By mid-1738, the fruit stalls were removed from the court, and no more stalls were to be allowed in the area at all, thus making it less of a public open space than before. A print, "View of the east side of New Square, Lincoln's Inn", was engraved by Sutton Nicholls in 1728, and published by John Bowles in London Described, 1731, in which the low range of the bog house is clearly visible, though I believe I was the first one to identify what it was in a book in 1992. Lincoln's Inn bog house was eventually dismantled and forgotten. By the 1890s the waste bit of ground behind the kitchen garden at the north-eastern corner of New Square was called The Bogs, though no one quite remembered why. The area has never been built over, and is a neat little garden today. It is one of the stops along the route of a gay history tour that is occasionally given. As I've noted elsewhere, public latrines have been convenient for cruising for centuries. For example, Arnold of Verniolle in the early fourteenth century made some of his pick-ups in the portico connecting the dormitory and latrines of the Franciscan convent of Pamiers and the baths of Ax-les-Thermes. In Amsterdam in the 1760s many sodomites were arrested in the public toilets that were built under the city's numerous bridges; the favourite toilets were even identified with special names, such as The Old Lady and The Long Lady. Urinals have acquired special cultural significance among queers. Jean Genet, who lived as a prostitute cruising the toilets in the beggars' quarter near the harbour in Barcelona in 1933, remembers an incident involving the "maricones": "Apparently, when an outdoor urinal, damaged by street riots, was condemned in 1933, a group of about thirty queens called the Carolinas descended the Ramblas de las Flores to the statue of Columbus. The Carolinas were dressed in mantillas and silk dresses; when they reached the beloved pissotiere they placed a bouquet of red roses beside it." Our culture covers up the smell. The walls shout of love and liberty. . . .
Long live the stinking washrooms! Copyright © 2001, 2014 Rictor Norton. All rights reserved. Reproduction for sale or profit prohibited. My comments originally appeared on the 18th Century Interdisciplinary Discussion List in February 2001.